Last night I tucked myself into bed happily thinking about all the snow that was supposed to fall when I woke up. But at 5:30am, it was only 36 degrees, and I grudgingly dragged myself out the door for another rainy trail run. HOWEVER on my way to Mendon Ponds, soft flurries began to fly, and I was positively grinning as I started off into the woods. It was quiet, dark, and still- just a hint of snow falling. As the sun came up, it stopped snowing, but when the sun finally peeked over the treetops, all the clouds cleared and it was blue and perfect. My Mendon 10k was as great as always! Perhaps best of all is that you hardly ever see anyone over there in the mornings-occasionally a lone rollerskier or dog-walker- but typically it's just you and the woodland creatures. 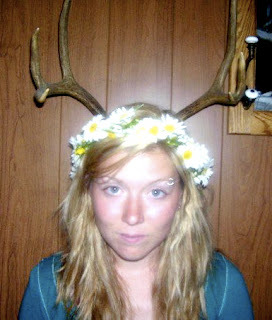 As a matter of fact, the ratio of deer to humans today was 15:1, if you count me as human.